Who are you? How do you answer when someone asks you that question? The most common answer is to give our name. We might also tell a bit of family history and the connections that help identify us. Often we’ll tell something about our work, the things we do, and how we spend our time. I cannot, however, think of a single time when I ever answered that question by saying, “Oh, I’m the salt of the earth. I’m the light of the world.” How about you? Have you ever answered that way? Has anyone ever answered you that way? Maybe, but I’m guessing probably not. Why not? Even if we’ve never said it aloud do we ever think of ourselves that way? Do we know that about ourselves? Jesus knows that about us. Jesus thinks that about us. Jesus even says that about us. It’s right there in today’s gospel (Matthew 5:13-20, Epiphany 5A). “You are the salt of the earth…. You are the light of the world.” Don’t think this is about somebody other than you. Jesus isn’t talking to particular individuals. He’s talking to the crowds that have followed him from Galilee, the ten cities known as the Decapolis, Jerusalem, Judea, and beyond the Jordan. That means they’ve come from everywhere. They’ve come to see this one they’ve heard about. They’ve come to listen and learn, to be healed, and to have their lives put back together. They’ve come in search of meaning, direction, and purpose. Jesus doesn’t stop there, however. There are profound implications to being named salt and light. It means that we are to flavor the world. We are to season and transform human activity in such a way that it reveals God in this world. It means we are to help people better see God’s life in theirs. It means we are to enlighten the dark places of the world. You and I are the means by which God flavors and illuminates life and the world. If last week, the Feast of the Presentation, Christ’s gospel showed us to be God-receivers, this week Christ’s gospel shows and calls us to be God-givers, God-sharers. Christ has given us the salt and light of his divinity not just for ourselves but that others might eat and see better. 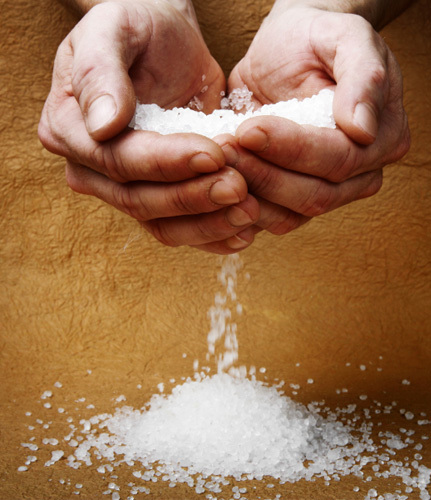 The salt of divinity that was poured into our hands we are to sprinkle onto the world. The light of divinity that fills our hearts and minds is to shine on and brighten all of life. So what does that look like? What does that mean for us? It’s really pretty practical and tangible. It’s something that can tasted and seen. It makes a difference in the world and to other people. It is looking another in the eyes, speaking a kind word, and acknowledging him or her as having been created in the image and likeness of God. Try that with someone you’ve labeled as a welfare mother, a panhandler, a gang kid. It is generosity with your compassion, time, and money to care for and make a difference in the lives of the poor, the hungry, the homeless. It is starting a conversation and rebuilding a relationship when what you mostly feel is indifference, pain, or anger. It is praying that God will bless with all the good gifts you want for yourself and those you love, those who have hurt you, those who are different from you, and those with whom you disagree. The prophet Isaiah speaks of loosing the bonds of injustice and letting the oppressed go free. So maybe salt and light look like politics that are not dependent on control and power, that establish a society of equality and diversity, and that recognize the dignity of every human being. Would you support that kind of legislation? Vote for that kind of candidate? Maybe even campaign as that candidate? It is faithfulness and commitment to others shown by listening, being available, and spending time. It would mean slowing down, rearranging your schedule, and valuing presence over efficiency and productivity. It is choosing a life of self-giving rather than taking and acquiring, vulnerability rather than defensiveness, and intimacy rather than isolation. It means you might, and probably will, get hurt. It is loving God, your neighbor, your enemy, and yourself. It means choice overcomes feelings. Where is the salt and light in your life? What does it look like? How does it show up? There are probably as many expressions and manifestations of salt and light as there are people. Ultimately though, they always look like the life of Jesus Christ. To live as salt of the earth and light of the world is to know our deepest, truest, and most authentic self. It is the life we long for and the life God desires us to have. It is both who we are how we are to be. That’s why Jesus is so adamant that we not lose our saltiness and we not hide our light. To do so is to lose and hide our life. To do so, in some way, denies Christ. Salt that has no flavor and light that is hidden are worthless. They’re not really themselves. They are neither true nor authentic. They’re not real. That’s neither what we want nor what God intends for us. No one says, “Pass the salt please,” hoping that that the flavor of their food will stay the same. No one walks into a room, flips the switch, and hopes the light won’t come on. Yet, we’ve all known times like that, times when our insides and outsides don’t line up, when something is amiss, and we’re just not ourselves. If we are salt and if we are light then we ought to be tasted and seen by the world. If our relationships are bland and flavorless, if our world is dark and filled with shadows, maybe we’ve not been faithful to or trusting of our own saltiness and light. Maybe we’ve forgotten who we are. Maybe we never knew. Regardless of where we are in life or our faith I think we are all looking for the salt and the light within us and how we can best be that for others. This past week I had at least five conversations about that very question. Not one person said the words salt or light but that’s what they were asking about. How to be real, authentic? How to make a difference? They were all searching, asking good questions, reflecting on their lives, and working to live faithfully with God and others. They all heard the echo of Christ’s words deep within themselves, the same words that echo within each one of us. With those words Jesus is declaring what already is. He is making a statement of fact. This doesn’t mean we must become something we’re not already. It means we are to become, live into, and manifest what we already are. That is both the good news and the challenge, to believe and become what we already are. It is some of our most difficult and most important work. I think that’s what Jesus is saying in today’s gospel. “Behold the salt that you already are. Behold the light that you already are. Become that for the life of the world. Let them taste and see.” I can’t tell you how to do that. It will be unique to each of our lives. It will be particular and specific to our individual circumstances and relationships. I don’t exactly know what you will do, where you will sprinkle your salt, or where you will shine your light, but I know this. In whatever ways you do that, wherever you do that, on whomever you do that, you will reveal the embodiment of God in humanity, God with us. In that moment they and you will taste life and see the world as never before. Let them taste and see, for you are the salt of the earth and the light of the world. The whole article is beautfully articulated and forthcoming. You have a very special God- given gift interpreting The Word of God. I only wish you would send this through on a Friday so some of us less talented, yet called on to speak in little country churches, could include some of your thoughts to a broader audience. And besides that, I had a seminary professor who once told me, “All originality and no plagiarism makes for a dull sermon.” At 82 it gets harder and harder to be original. I end up telling the same old story of Jesus and His love. Thank you for sharing with your sisters and brothers in the faith. Have a blessed day. Mr. B+, thank you for reading my blog and for your encouraging words. I like what your professor said; very true. In some way we all are telling the same story over and over. That story of God’s love is really the only one to tell. I wish I could post earlier but more often than not I am still working and praying with the text right up to Sunday. I confess I had to give it a lot of thought before Sunday School yesterday. We added a third metaphor, sugar, and we talked how cakes may taste without. And used torches to cast light on the dark, hidden corners of the room. Lots of giggles there, of course. And what a variety of words the children came up with to describe themselves when they are sweet or luminous or, by contrast, bitter or gloomy! Thank you Estera. I love your creativity with the kids and how you make the lesson so tangible. Great sermon! Sorry I missed the live presentation! Thank you CM. I missed you being there and I’m glad you are home.